'And we played until our awareness became embedded in the canyon and summoned a ghostly, floating train, an apparition of metal meeting metal, reflected doubly, triply, endlessly from the canyon, from the mind, from the flickering passenger windows, the rumbling ties, our ears felt like canyons. We didn't speak until morning.' Pauline Oliveros. “Acousmatic listening”, as described by Pierre Schaefer, refers to hearing a sound without seeing what it causes - in it's original sense “acousmatique” refers to the disciples of Pythagoras who listened to their master from behind a curtain, without seeing him, in complete silence. Pauline Oliveros' “Deep listening” is an album recorded in a large cistern under the ground with a 45 second natural reverb. It also refers to a very intuitive and encompassing attitude of listening. 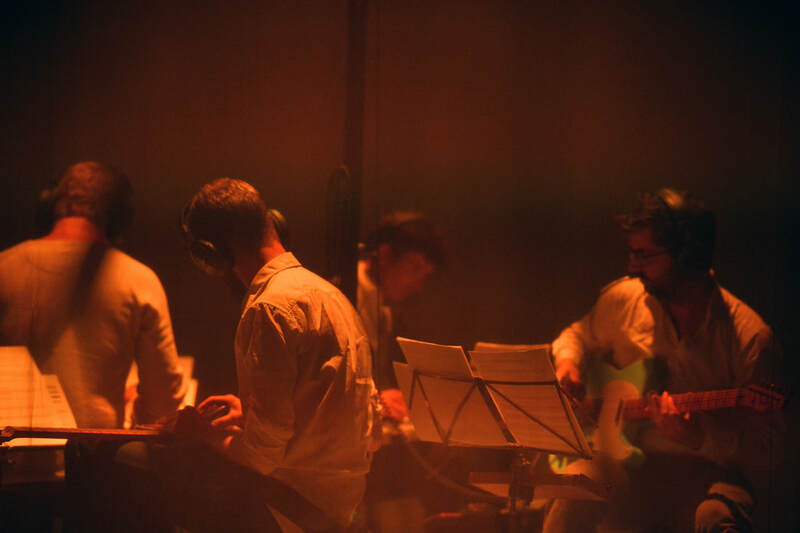 With Our Ears Felt Like Canyons Zwerm proposes an immersive concert setting where the four musicians are in the center, obscured – using adapted lightning - facing each other, with the audience surrounding them. The electric guitar, allowing to create complex sounds with little movement, acts as a sort of “pythagorian curtain”, stripping the performers from most of the visual theatrics that go with a live performance and shifting the action more towards the ear and the act of listening. Zwerm asked composers Joanna Bailie, Christopher Trapani and Alexander Schubert to write new pieces with this idea in mind, creating a musical triptych which explores the refined spectral-microtonal roots of New Orleanian Christopher Trapani, in between the pure and minimalist soundscapes of Joanna Bailie and the psychedelic noise of Alexander Schubert. Three sonic tableaux that will, each in their own way, fit this specific soundscape environment and acousmatic context very well, creating a unique concert experience. Our Ears Felt Like Canyons is production of Zwerm in collaboration with the Ruhrtriennale and Transit Festival, with the support of the Flemish Government. Concept & development: Zwerm & Lucas Van Haesbroeck. Live music ZWERM. Sound design & sound engineer: Johan Vandermaelen. Scenography & Light design: Lucas Van Haesbroeck. Photo: Mous Lambarat. Thanks to: Walpurgis.